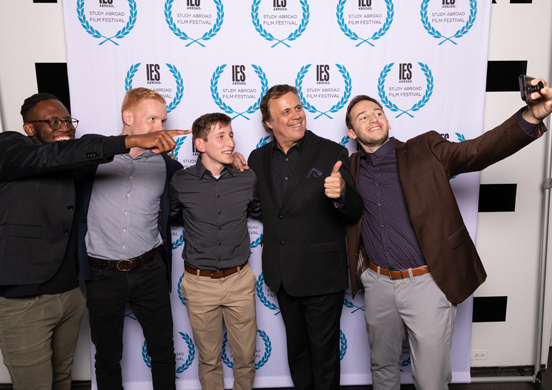 Tremendous, world-class talent, creative, original—these are just some of the words award winning Film Critic Richard Roeper used to describe this year’s Finalist films at the 2018 IES Abroad Study Abroad Film Festival event. 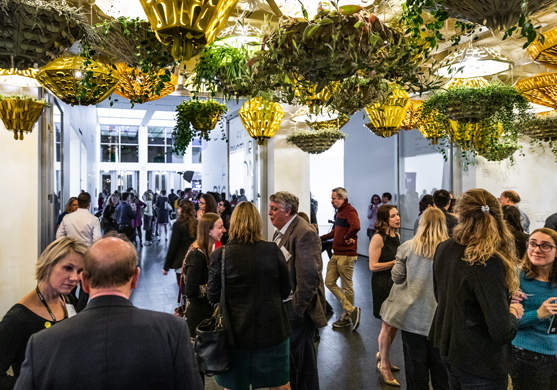 Richard hosted the event held at the Museum of Contemporary Art (MCA) Chicago on Wednesday, November 7th, which was in benefit of IES Abroad scholarships. We are excited to share that Philip Baites (IES Abroad Rabat, Academic Year 2017-18, University of Tennessee, Knoxville) was announced as the night’s Grand Prize Winner for his film, Tangier to Casablanca. The film, which features an original song written by Philip, encapsulates his nine-month study abroad experience with IES Abroad Rabat in Morocco. Originally from Nashville, Tennessee, Philip is a French and International Business major and an Arabic minor at the University of Tennessee, Knoxville. During his freshman year of college, he began to expand his worldview by studying French and meeting international students on campus. Little did he know, these encounters and new friendships would set him on a trajectory of being an international student himself three years later, and an award-winning filmmaker! An Academic Year student, Philip explained that he didn’t start producing the film until his second semester abroad. “I started thinking about my host mother and her story of losing her father while I was there, and I realized a lot of the lyrics taken from her perspective really take on a new meaning, a much deeper feel,” Philip said. The films were viewed and narrowed down to the three finalists by a prominent jury of directors, editors, producers, and screenwriters, all of whom are either IES Abroad alumni, film studies faculty from the organization’s international Centers, and/or film industry experts. Over a span of five years, more than 120 colleges and universities have been represented through 358 student film submissions, all documenting the various experiences at IES Abroad study abroad programs around the world. 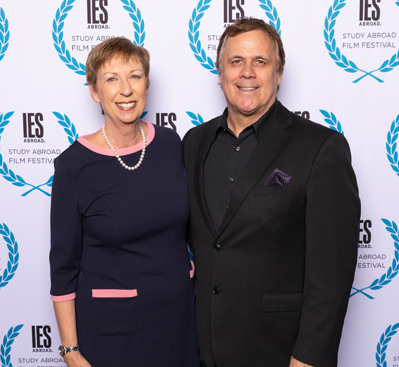 The Film Festival event, which is intended to raise awareness about the IES Abroad scholarship fund, raised just more than $21,000 to help even more students study abroad. The audience included former Film Festival finalists, jurors, alumni, IES Abroad staff, partners, donors, and friends, all in attendance to support the Film Festival finalists as they showcase the power of study abroad. The evening began with the audience enjoying six of the semi-finalists films, including a moving interview with an eccentric homestay mother in Granada, a video diary of Shanghai, a self-reflection of an international student studying abroad in Rabat, and more. President and CEO Dr. Mary M. Dwyer provided opening remarks for the evening, and also presented Film Festival juror Willard Huyck with the inaugural Standing Ovation Award, which honors an individual or group whose outstanding contributions have enabled us to continue to provide a platform for students to share their study abroad experiences through film. Willard, a celebrated, Academy Award-nominated screenwriter and director, “epitomizes the inspiration behind this award,” Mary says. After viewing all three of the Finalist films, the audience got the behind-the-scenes scoop on the creative process and production of each film. 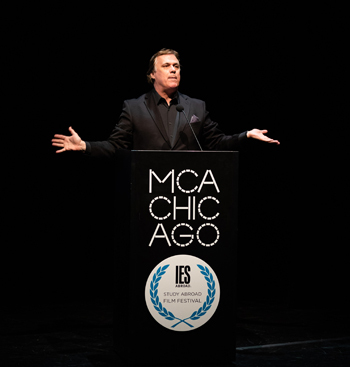 Unfortunately, Kate Flannery was not able to join us due to illness, but we were glad that American columnist and film critic, Richard Roeper, best known for his television series At the Movies with Roger Ebert, was able to host an exciting event! Richard gave thoughtful commentary and critique on all three of the films during a Q&A with the Finalists. After the Q&A, Philip was announced as the Grand Prize Winner! Voted on by the public on the IES Abroad website, Philip’s big win earned him the Grand Prize trophy and $1,500 cash prize. Ismael Byers (IES Abroad Santiago, Spring 2017 | Hope College), our 2017 Film Festival Grand Prize Winner, was on-hand to present Philip with the Oscar-look-alike golden trophy. Ismael shared the trophy with Philip, but had a surprise for him, as well: a heartfelt video message from Doha, Philp’s host mother! “Morocco really taught me that, in the end, being genuine and loving pays back dividends,” Philip adds. 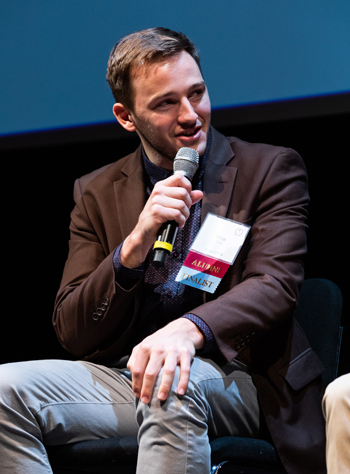 His film beat out Erik Patak (IES Abroad Auckland, Fall 2017 | University of Rochester) and Penn Harrison (IES Abroad Barcelona, Spring 2018 | University of Texas at Austin) to claim the top prize. A reception was held after Philip’s acceptance speech, where he serenaded the crowd with a performance of his award-winning song. “Absolutely loved this! Such a unique take on the 'tell your study abroad story' challenge. The music perfectly captures the beauty of Morocco, its people, and the experience of study abroad." Thank you to all of our 2018 Film Festival jurors, sponsors, volunteers, and, of course, our student filmmakers. Learn more about our Study Abroad Film Festival, see past years' winning films, and find out how to be part of the 2018 Festival! Interested in studying film abroad? Check out all of our Film Studies or Film Production programs and courses around the world.